Protected in a small, sheltered depression a hundred meters above ground, they float effortlessly among the clouds. They are richly adorned with ample bosoms and sinuous bodies barely concealed beneath translucent gossamer garments. Some say they are celestial nymphs carrying flowers to shower upon kings and mortals below. Others suggest that they are queens and concubines. 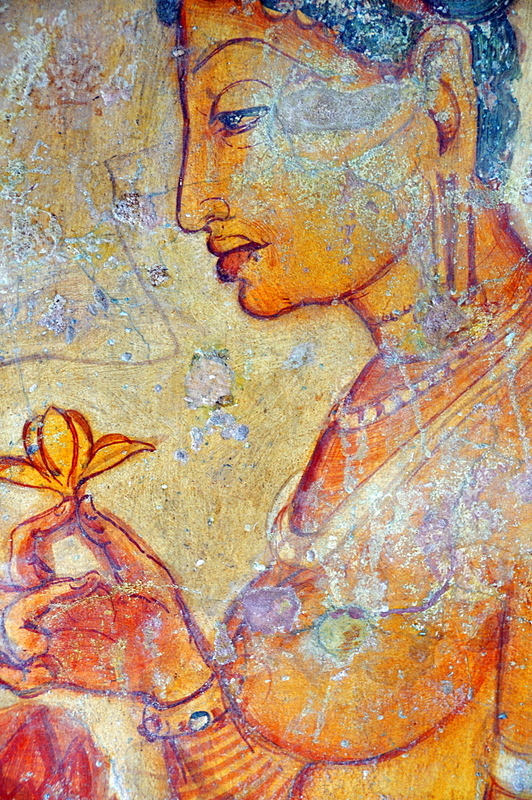 Some even suggest that they are the manifestations of the goddess Tara. They have been the subject of speculation for nearly one thousand six hundred years. These nymphs of the mountain, in turn, have remained silent, smiling enigmatically, their secret intact for over 1,600 years. The names of the ladies and the artists who painted them are lost to history. Their legacy has survived for over half a million days, a testament to the genius of their creators and the king who commissioned them. Halfway up the Sigiriya rock an open-air spiral stairway leads to a long, sheltered gallery in the sheer rock face. 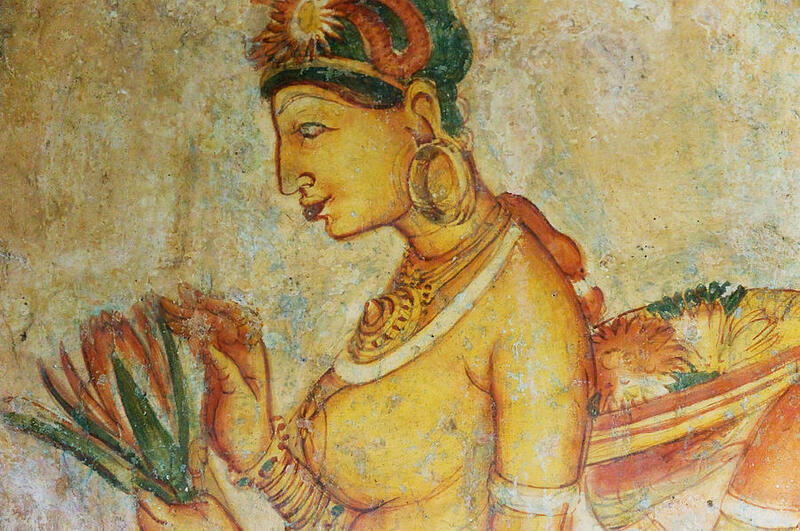 The paintings of the buxom, wasp-waisted women are popularly believed to represent either apsaras (celestial nymphs) or King Kasyapa’s concubines. Protected from the sun in the sheltered gallery, the frescoes remain in remarkably good condition, their colours still glowing. Modern theory suggests the female forms represent aspects of Tara – a bodhisattva and one of the most important figures in Tantric Buddhism. 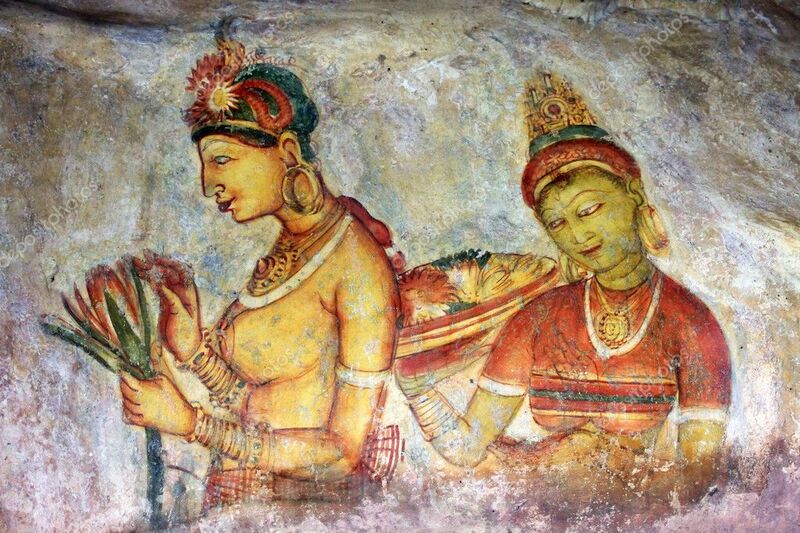 They are similar in style to the rock paintings at Ajanta in India, but have a specific character in their classical realist style. 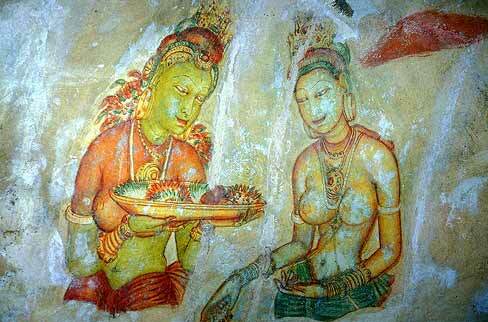 No one knows the exact dates of the impressive frescoes, though it’s unlikely they date as far back as the 5th century (when King Kasyapa reigned). The paintings are at their best in the late-afternoon light. Photos are not allowed.